See Calgary: do it on Calgary bike paths. Let's face it, the only real way to get around here is with two pedals and two wheels. So, okay a car does offer you more comfort, and keeps the rain and sun off your head, unless you've got a convertible. But if you're feeling a little bit more adventurous, and don't mind roughing it a little, then here's one solution available for you. Calgary's bike paths. Besides, it'll do you some good. With all the rough and tumble readiness that Calgary has to offer you, the one thing you won't want to miss is the authentic Calgary that harkens back to its roots. And really, there's only one way to go about it and that's on a bike. If you haven't ridden for years, don't worry, the old saying, "it's like riding a bicycle, you never forget how" wasn't coined for nothing. Although there's a good chance the person who came up with that wasn't on the business end of the bike! Truly though, there's nothing to worry about, a few quick practice runs should have you sorted out in no time and before you know it, you'll be fighting fit and raring to take on the tour de France! Only kidding, of course. And although I wouldn't recommend that just yet, in Calgary bike paths are next to a dime a dozen and you shouldn't have too much trouble finding a suitable beginner's path to test out your newly regained skills. Oh, the fun you'll relive. Start with this giant detailed pdf map from the City of Calgary website. You will need to zoom in on your area. The legend is near the southwest corner, showing you various trail types, distances, bridges, parking and more. Once you're familiar with all the necessary maneuvers like 'Stop', 'Go', and 'Emergency Brake!' and you're able to stay on longer than five minutes, you're good to go. The next thing you'll need to do is actually find your way around the numerous paths so you don't get lost. 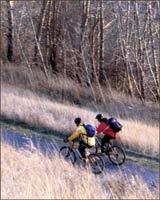 A Calgary bike path map is probably the best way to go, and they're easy enough to obtain. Ask at a book store or your hotel. They'll probably be able to provide you with one without a problem. Canadian Tire and Co-op are two examples that I'm aware of. Then again if you've only got a limited amount time to spend in Calgary it's probably a good idea for you to get your hands on one beforehand to plan your journey. And in this day and age your quickest option is to resort to the one on the internet link above. So, now that you've done that, you're next decision should be whether to take the Trans Canada Trail, or the Cowboy Trail? Or better yet, you could just take it easy and relax while you take a leisurely tour of the more quiet and sedate Calgary bike paths available. Go back from Calgary Bike Paths to the Internet Site Map web page.